Gibson K-1 Model Carved Top Mandocello (1914), made in Kalamazoo, Michigan, serial # 27688, natural top, cherry stained back and sides finish, birch back and sides, spruce top; mahogany neck with ebony fingerboard, black guitar-shaped hard shell case. We feel the Gibson Mandocello is one of the great under-appreciated instruments of the early 20th century. 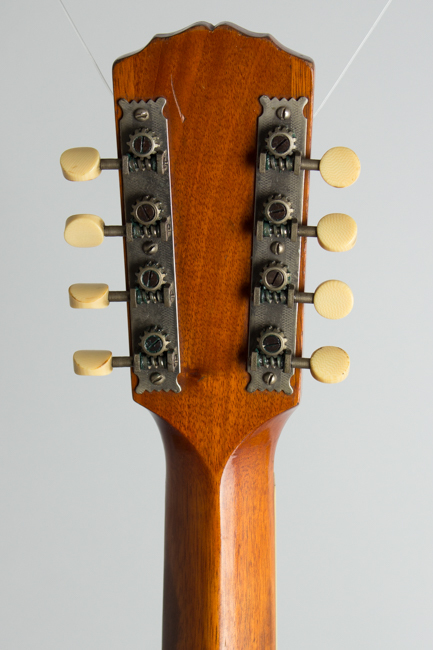 Originally designed for use in 1910s mandolin orchestras, these imposing beasts never found a home in any other style of music despite being wonderful and unique-sounding instruments. Double-strung and tuned in fifths starting with the C below the low E on the guitar, the mandocello has an imposing tone and deep resonance quite unlike any other fretted instrument. OK, we're starting to sound like an old Gibson catalog here, but we really like these and are always happy to get one in stock! This particular instrument is a Style K-1, the most basic of the three mandocello models Gibson offered in the 1910s but still a fairly expensive instrument when new. It is structurally the same as the fancier Model K-2 with a little less "geegaw" (decoration). The headstock face carries just a plain pearl "The Gibson" inlay while the tuners are tipped with unadorned ivoroid buttons. 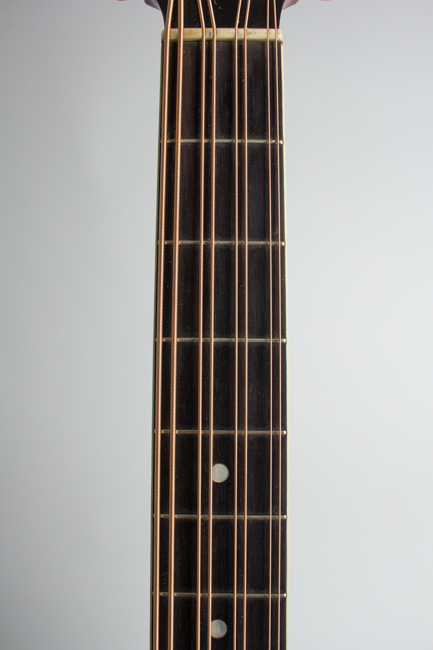 The sound hole decoration is made up of two separate half-herringbone wood inlaid rings and a bound edge. 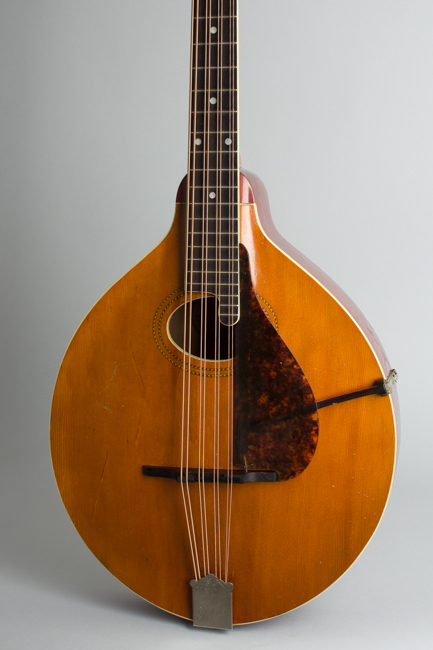 The K-2 had fancier versions of these decorative touches, but the physical features and sound were the same for both models, with an oval body, bound carved spruce top, and birch back. The necks are mahogany with a bound and dot-inlaid ebony fingerboard. 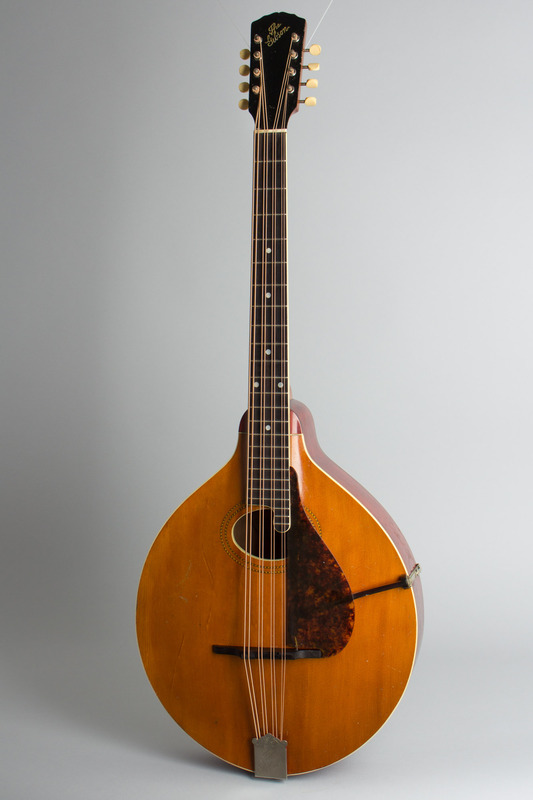 This 1914 "Pumpkin top" K-1 Mandocello dates to the decade when Gibson was defining the market for these mandolin family instruments. 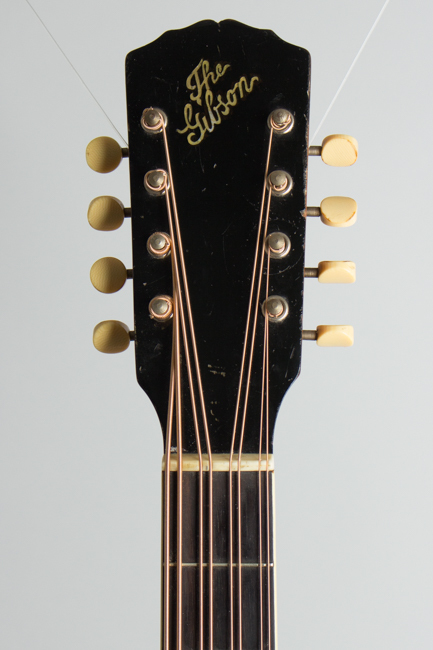 In the 1910s-'20s these Gibsons were only available from licensed teacher-agents, and were usually purchased on time along with lessons. 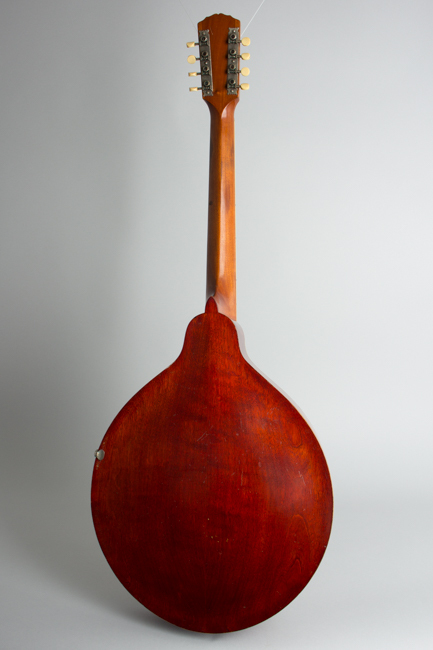 As part of the deal, the students would often play in the teacher's fretted orchestra, and the low-tuned mandocello was crucial to achieving a full sound in these ensembles. 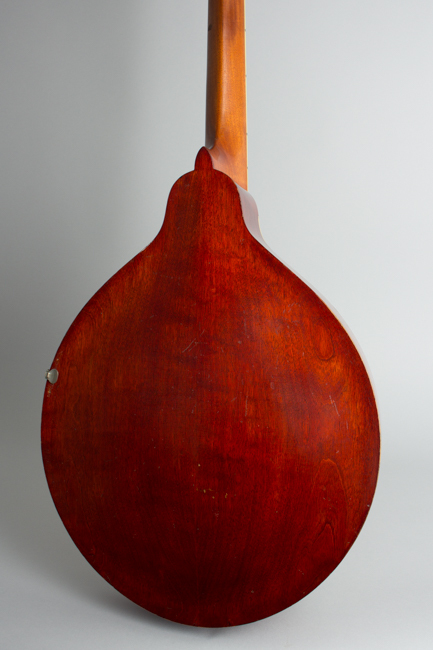 Far fewer were sold compared to mandolins, however, making Gibson mandocellos from any era a comparative rarity. 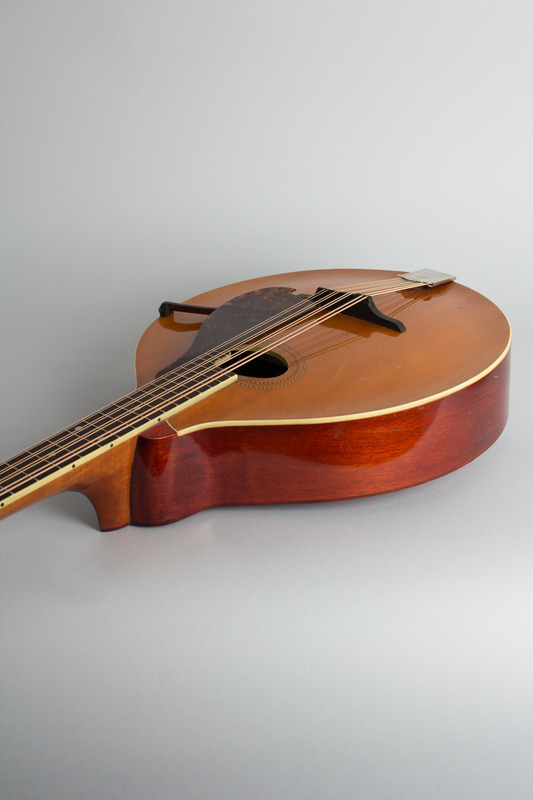 The mandocello with its 8 strings and "C" orchestral tuning has a totally unique sound and makes an excellent recording instrument. It can be employed for a wide range of playing styles, some still yet to be explored! Overall length is 38 7/16 in. (97.6 cm. ), 14 1/8 in. (35.9 cm.) width, and 3 3/8 in. (8.6 cm.) in depth, measured at side of rim. Scale length is 24 5/8 in. (625 mm.). Width of nut is 1 5/8 in. (41 mm.). This is a very well-preserved example of a 'teens K-1, one of the nicer ones we have had. 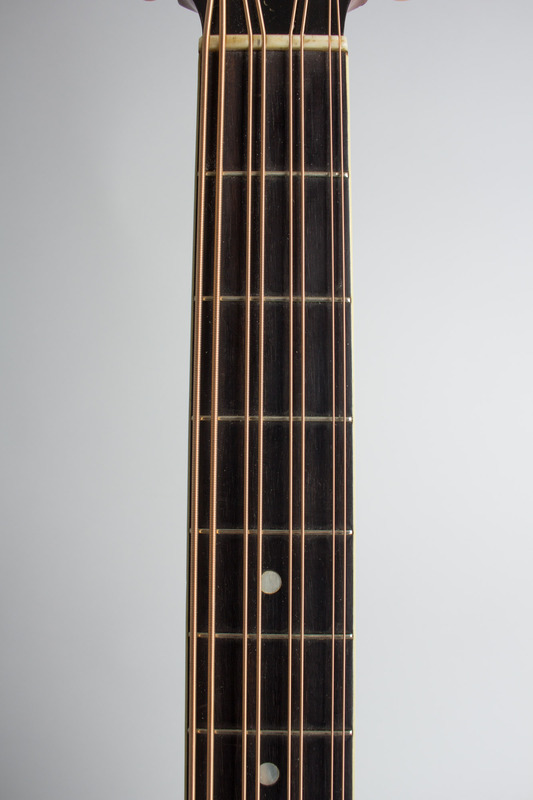 The finish shows some wear and checking, but no major loss except to areas of the back of the neck in the lower positions, a deep ding behind the 5th fret, and a long scrape on the upper top. All hardware is original, the neck and frets are in very fine shape, and this is an excellent playing and sounding mandocello. Excellent Condition.